Before the Indica, it was only Maruti churning cars in the country. Indica was a big step for Tata Motors as erstwhile they have always been Utility Vehicle manufacturers. It was a tough job for them to change the strong mindsets of all. The Indica was designed by an Italian design firm and was an instant hit in its 2 years of launch. However, it did face criticism for its performance and mileage which the company improved in subsequent iterations. The Indica was design by the Italian design house I.DE.A (Institute of Development in Automobile Engineering) and has received only minor changes since. Compared to other hatchbacks like the Hyundai i10 and Maruti Suzuki A-star, the Indica sure does look old. At the front is a typical Tata smiley grille with the company’s logo at the centre. Tata has redesigned the front lights and added bigger fog lamps. A big air intake is fitted into the bumper and adding some personality to the exterior is the body coloured OVRM’s and the blacked-out B pillars. There Indica sits on small 14inch wheels which look a bit out of place with the flared wheel arches. The rear looks a bit better than the front with the elongated taillights. Step inside and you are greeted by the familiar Indica cabin, which keeps evolving over time. While the dashboard design remains similar to the V2, the 2013 Tata Indica gets improvements in quality along with dual tone interiors of ebony black and sahara beige. The seats are now beige in colour with similar coloured inserts making their way on the door pad. The side AC vents, centre console, gear knob and glove box knob are finished in silver metallic colour. Where the Indica continues to score well is the space. The vehicle boasts of excellent interior room for all passengers and this car can truly seat five in comfort. The use of beige makes the cabin a bit more airy and the large glass area ensures that passengers feel at ease even on long journeys. The seats offer good comfort although the rear bench doesn’t have adjustable headrests. Boot capacity is good and there are quite a few storage spaces inside the car including a new magazine and cup holder in the front doors. There is a storage area below the steering wheel as well. The Indica pleads its cause for fuel efficiency by tossing 5PS of power overboard while pumping up the torque to 122Nm. More power may be on top of the wish list of many hot-prods; but the best part of one billion folk would much rather nurse each rupee further down the road. On the move, the 5PS that’s trotted off from under the hood is hardly missed, whether on the highway or city. While the dash from 30-70 is a reasonable 8.8s, the roll-on figures from the higher gears seemed slow; the gearing now aimed at extracting better mileage figures. With the introduction of the Quadrajet under the Vista hood, Tatas have made a significant change in the way the car would ride. The petrol-driven models of Tata Indica Vista are powered by 1.2L CVCP Safire engine, which produces a maximum power of 65 bhp 5500 rpm and torque of 96 Nm @ 3000 rpm. The two diesel variants of Tata Indica Vista are 1.4L turbocharged inter-cooled TDI engine and 1.3L Quadrajet Common Rail diesel engine. With 71 bhp @ 4500 rpm of power, the TDI engine delivers a maximum torque of 135 Nm @ 2500 rpm. The Quadrajet engine delivers a higher torque, of 190 Nm @ 1750 rpm, and churns out a power of 75 bhp @ 4000 rpm. 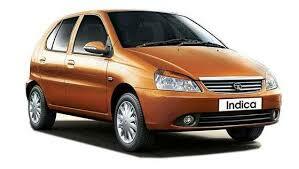 All the engines of Tata Indica Vista have five-speed manual transmission. The Tata Indica has never been applauded for its handling and the latest model is no different. What really robs away the feel from the car is the extremely large steering wheel (placed too high) and imprecise feedback from it. There is quite some body roll and the Indica is not a car you would push through the corners as it simply doesn’t convey to you what’s happening at the front wheels. High speed stability is good though and the Indica doesn’t feel unsafe or nervous at triple digit speeds. Where the Indica does fare very well is the ride quality. The vehicle has been known for absorbing most of the bumps on the road and Tata Motors has now updated the suspension shifting to a dual path front suspension which enhances ride comfort slightly. The Indica gobbles up most of the bumps on the road with authority although low speed ride isn’t as comfortable with a bit of bouncyness being felt by rear seat passengers. The brakes offer decent stopping power but the pedal positioning needs a re-think as their placement is very odd. The Indica has been slogging for a long period now and it desperately needs a major makeover. Unlike Maruti, which even though is popular among fleet operators still remains an instant favorite among everyone. Superb build quality, great fuel efficiency and the never ending dealership network are the strong pillars of Maruti in India.